How do you make half the mass of two continents disappear? To answer the question you first need to discover that it's missing. 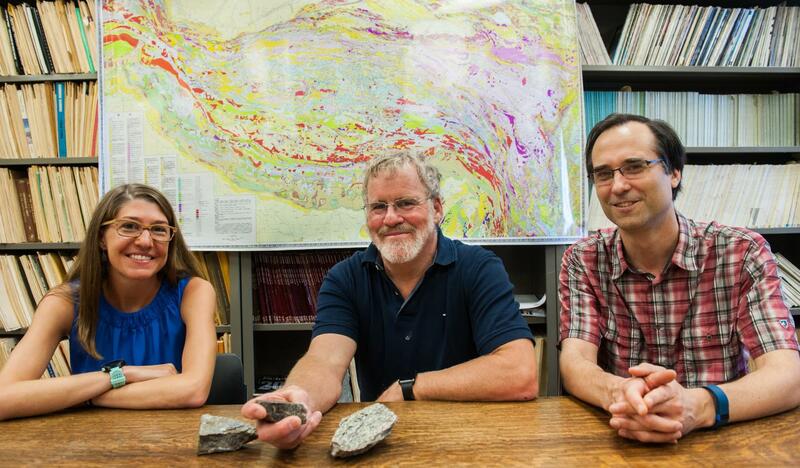 That's what a trio of University of Chicago geoscientists and their collaborators did. Their explanation for where the mass went significantly changes prevailing ideas about what can happen when continents collide. It also has important implications for our understanding of when the continents grew to their present size and how the chemistry of the Earth's interior has evolved through time. The study, published online Sept. 19, 2016, in Nature Geoscience, examines the collision of Eurasia and India, which began about 60 million years ago, created the Himalayas, and is still in (slow) progress. The scientists computed with unprecedented precision the amount of landmass, or "continental crust," before and after the collision. "What we found is that half of the mass that was there 60 million years ago is missing from the earth's surface today," said Miquela Ingalls, a geophysical sciences graduate student who led the project as part of her doctoral work. The result was unexpectedly large. After considering all other ways the mass might be accounted for, the researchers were forced to conclude that so huge a mass discrepancy could only be explained if the missing chunk had gone back down into the Earth's mantle — something geoscientists had considered more or less impossible on such a scale. When two tectonic plates come together, something has to give. According to plate tectonic theory, the surface of the Earth comprises a mosaic of about a dozen rigid plates in relative motion. These plates move atop the upper mantle, and plates topped with thicker, more buoyant continental crust ride higher than those topped with thinner oceanic crust. Oceanic crust can dip and slide into the mantle where it eventually mixes together with the mantle material. But continental crust like that involved in the Eurasia-India collision is less dense and geologists have long believed that when it meets the mantle, it is pushed back up like a beach ball in water, never mixing back in. "We're taught in Geology 101 that continental crust is buoyant and can't descend into the mantle," Ingalls said. The new results throw that idea out the window. "We really have significant amounts of crust that have disappeared from the crustal reservoir and the only place that it can go is into the mantle," said David Rowley, a professor in geophysical sciences at UChicago who is one of Ingalls' advisors and a collaborator on the project. "It used to be thought that the mantle and the crust interacted only in a relatively minor way. This work suggests that, at least in certain circumstances, that's not true." The scientists' conclusion arose out of meticulous calculations of how much mass there was before and after the collision, and a careful accounting of all possible ways it could have been distributed after. Computing the amount of crust "before" is a contentious problem involving careful dating of the ages of strata and reconstructions of past plate positions, Ingalls said. Previous workers have done similar calculations but have often tried to force the "before" and "after" numbers to balance, "trying to make the system match up with what we think we already know about how tectonics works." Ingalls and collaborators made no such assumptions. They used recently revised estimates about plate movements to figure out how large the two plates were at the onset of collision, and synthesized more than 20 years' worth of data on the geology of various regions of the Earth to calculate how thick the crust would have been. "By looking at all of the relevant data sets, we've been able to say what the mass of the crust was at the beginning of collision," Rowley said. "But accounting for all of these different types of mass loss, we still find that half of the continental crust involved in this collision is missing today," Ingalls said. "If we've accounted for all possible solutions at the surface, it means the remaining mass must have been recycled wholesale into the mantle." If large areas of continental crust are recycled back into the mantle, scientists can at last explain some previously puzzling geochemistry. Elements including lead and uranium are periodically erupted from the mantle through volcanic activity. Such elements are relatively abundant in continental crust, but scarce in the mantle. Yet the composition of some mantle-derived rocks indicates that they have been in contaminated by continental crust. So how did continental material mix back into the mantle? "The implication of our work is that, if we're seeing the India-Asia collision system as an ongoing process over Earth's history, there has been a continuous mixing of the continental crustal elements back into the mantle," said Rowley. "And they can then be re-extracted and seen in some of those volcanic materials that come out of the mantle today."